There are five main different states of the brain; named after the Greek alphabet; Delta, Theta, Alpha, Beta, Gamma. These are named to differentiate between different types of brain activity; from deep sleep (Delta) to awake and focused (Gamma). It’s useful to know and recognise these different states when learning about astral projection. Binaural beats are associated with techniques used to manually change your brain state. Delta waves are present when we are asleep, in bed and not dreaming. Delta waves are also associated with cortisol reduction, pain relief, deep sleep and healing. Delta waves are treated as rest; you need to be ‘off’ to experience being on. If you are feeling exhausted and ill, Delta waves will be a good thing to listen to, if you are looking to try out binaural beats. Theta waves are associated with dreaming, as it is in this state that REM sleep occurs. There are many audio tracks for theta wave binaural beats, although you can enter a theta state simply by meditating. In a theta state, you are more relaxed than usual, and can become more creative, you will be able to better solve problems and come up with solutions in a theta state. Alpha waves (also known as the alpha state) are associated with relaxed focus and positive thinking. There is little stress. Think of a time when you were engaged in an activity without putitng any effort in. Something you are so good at that you don’t even need to think about it. This is the alpha state. Some call it ‘flow’. Alpha is a good state to be in before attempting astral projection, as you having nothing to worry or think about is key to a successful attempt. Beta waves occur when you are focused and attentive on a subject. Consider solving a maths problem, taking notes on a lecture, playing attention through parts of a difficult film or trying to solve a mystery that is bugging you. These are not states you want to be in to attempt an astral projection, it promotes a very physical sense of reality where things are solid and grounded. Gamma waves are the fastest brain state and occur when we are deep in concentration; for example trying to remember past events or performing very focused meditation. 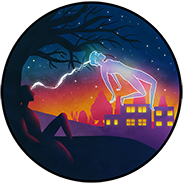 People with high gamma activity are very known to be very intelligent, so while not directly linked with astral projection, the gamma state benefits us greatly. Using binaural beats, you may be able to trigger gamma states more often.